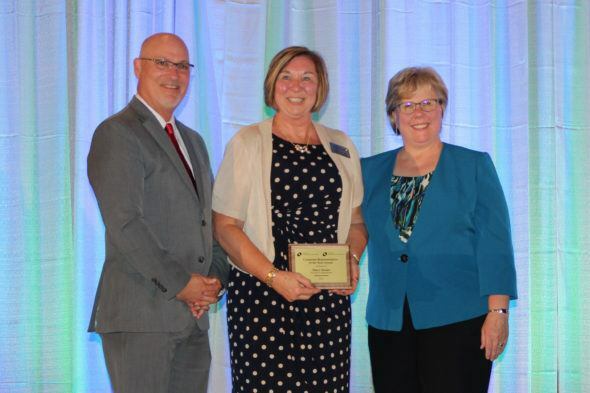 On Sept. 21, Mary Moser, Director of Operations at Heritage Communities in Omaha, received the 2016 Corporate Representative of the Year Award from the Nebraska Nursing Facility Association/Nebraska Assisted Living Association (NNFA/NALA). The award was presented to Mrs. Moser at the associations Fall Convention in La Vista, Nebraska, for providing outstanding support to facility staff. Mary is an integral part of Heritage Communities. Not only is she a resource for the Executive Directors in our buildings, she also understands the demands of their role, having been an ED herself, said Farhan Khan, CEO of Heritage Communities. Nebraska is filled with people like Mary Moser who contribute to the quality of life of residents in our states nursing and assisted living facilities. It is our pleasure to recognize Mary in this way,î said Heath Boddy, President and CEO of NNFA/NALA. More than 800 nursing and assisted living facility owners, administrators, staff, and vendors participated in the four-day convention.